Make your wedding memorable with our shells, salutes and smaller multi-shot aerial cakes. Our wide range of wedding pyrotechnics grant you access to hundreds of impressive fireworks that can last up to 15 minutes creating a fantastic show that all your guests will live to remember. With our affordable firework packages, you can fit a fantastic fireworks display into your wedding plan at a modest budget. We know what it takes to make your wedding the best. It has taken us years to master this art – and we can’t wait to convert your wedding into a cherished memory. Our huge variety of superbly designed comets, shells and stars are perfect for any wedding theme. It doesn’t matter whether you want a small fireworks show or a huge spectacle visible from miles away. We will always have just the right mix of glowing fireworks for every wedding occasion. We believe in creativity, uniqueness, and functionality. We understand that every beautiful fireworks display is born of creativity and precision. That is why we dedicate ourselves to designing a huge variety of shells, comets and multi-shot aerial cakes. Our pyro technicians will use their creativity and skill to blend our different products and create a show like never before. 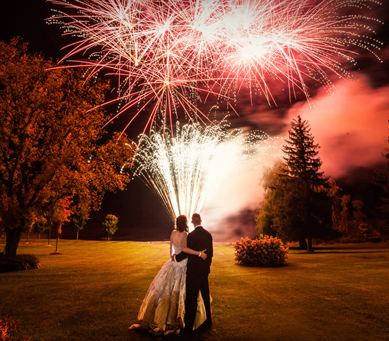 You can rest assured that your wedding fireworks will be just as stunning as they are memorable. Our fireworks display will always be in perfect synchrony with the wedding. With our high precision pyrotechnics and the highly skilled team of technicians, you can create anything from a huge display at the right moment to elaborate displays that are fully choreographed to the music. Our passion and dedication to creating the best wedding fireworks will reflect on the perfect timing and implementation of each star, shell or multi-shot aerial cake firing. To us, everything from our designs, product catalog and pyrotechnics firing, has one simple aim – putting huge smiles on everyone’s face. By designing highly effective aerial firework shells that guarantee you of point blank accuracy and deploying a certified firing team, we assure you of creating a stunning display to grace your perfect day. We live and work on a strict code of safety, precision and reliability. You can always count on our pyrotechnics and the firing team to deliver the appropriate firework at that precise moment. By designing smaller multi-shot aerial cakes with low noise thresholds, we give couples wedding in confined spaces with strict noise regulations access to the magic of fireworks. Our special purpose wedding decorations and fireworks will let you light up the skies without breaching any of the noise limits. Combine this with the minimal fallout and you get a pyrotechnics show that spreads beyond your wedding venue without spewing litter all over. Get in touch today! We’ll turn your wedding into a true memory. Let us lend a fresh breath of life to the celebrations and ambiance by adding perfectly timed fireworks displays. We believe in fitting every wedding pyrotechnic on the clients own budget. That is why we do an elaborate venue and program assessment before setting up our fireworks. Contact us in advance and let’s create a masterpiece of the most memorable day of your life, your wedding!